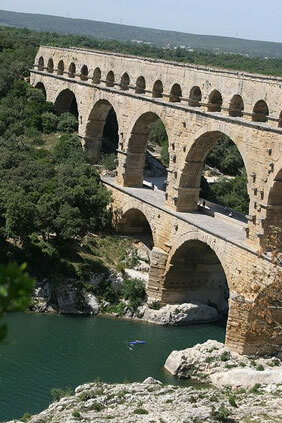 Avignon, Pont du Gard, Arles, St Remy-de-Provence, Luberon, L’Isle sur la Sorgue, and more! 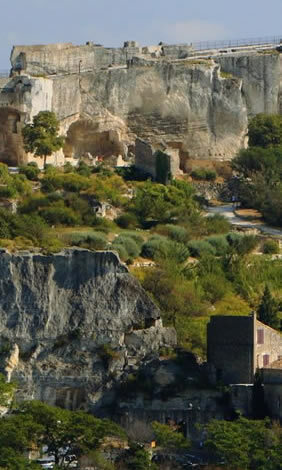 Visit castles, chapels, cafes, museums, meadows, vineyards, and a wildlife preserve on this gay bike tour of Provence, France. Stroll among the remains of a feudal fortress and a crumbled theater. Picnic at a Roman aqueduct. 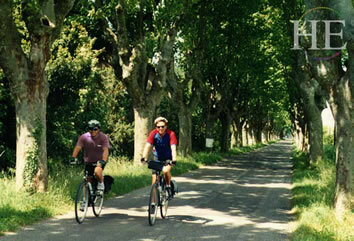 Bicycle through the magical forests and golden stone villages of Luberon. • Climb the time-worn stone steps at Arles’ Roman amphitheater, its walls still ringing with the sound of ancient gladiator fights. 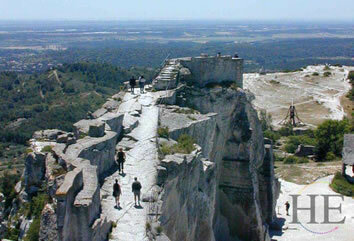 • Gaze out over the vast countryside from the ruins of Les Baux, a legendary court of love in the 13th century, later the refuge of brigands. • Cycle past the hauntingly familiar sites that Van Gogh painted during his remarkable years in St.-Remy-de-Provence. • Browse at the famous antique markets of Isle-sur-la-Sorgue. • Take a break from cycling, to stretch your legs in an endless field of scarlet poppies. Our week begins in Avignon, a walled city settled by the Romans. Avignon reached its height in the 14th century, when much of Europe was in chaos. Pope Clement V fled the anarchy of Rome and made his home here in Provence. For 68 years, Avignon served as the papal seat of seven Popes, each adding new embellishments to the palace. Today the enormous maze-like Papal Palace, sitting high on a rock, is a fascinating attraction for visitors. This tour starts and ends in Avignon, southern France. Each bike trip officially starts at 6:00 p.m. on the starting date given on our schedule and trip overview. We’ll have a reception and briefing, followed by dinner. For those who arrive early, we offer an optional walking tour of town (along with a chance to meet other early arrivals). Finally, when our guides’ schedule allows, you can give your bike a test ride at 3:00. On arrival at the hotel, please look for our sign in the lobby giving details. Each trip ends after breakfast. There are no group activities on that day, so if you have tight travel connections, you can get up and leave as early as you wish. When your schedule allows it, you’ll probably want to spend some time sightseeing in town, with others from the trip, before departing. Avignon is easily reached by train from Paris; it’s about a 4 hour ride on the high-speed TGV train, which you can catch right at Charles de Gaulle airport, or in downtown Paris. Avignon has two train stations: Avignon Centre is right outside the town wall. Avignon TGV station is a short cab ride from town; there are also shuttle buses. (TGV trains, as of this writing, can use either station.) 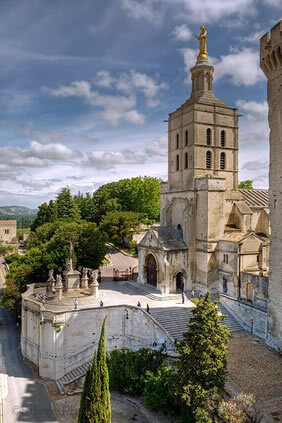 You can also fly into Avignon from Paris and take a cab (about $20) to our hotel. What’s the train schedule from Paris? 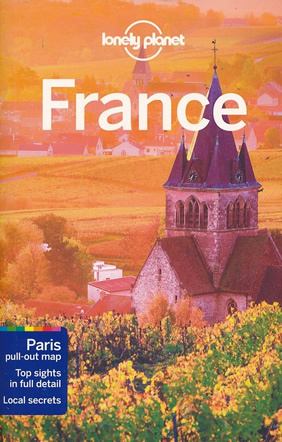 You can get up-to-date rail schedules, as well as information about railpasses for France, and other European travel, from Rail Europe. For trains from Paris, you can select Paris (for trains departing from downtown stations) or Paris CDG Airport for trains from Charles de Gaulle Airport to your destination or a nearby TGV station. How can I get to Avignon from Marseilles? Probably, best way to get from Marseilles-Provence Airport (MRS) to Avignon (other than a very expensive 75 km cab ride or rental car) is to take the shuttle bus to either Marseille St. Charles Station or to Aix-en-Provence station, then take the train to Avignon (either the old Centre station two blocks from our hotel, or the TGV station on the edge of town, and a cab ride from the hotel). Because MRS is somewhat north of Marseille, the route via Aix is shorter but may take longer because there are fewer Aix to Avignon trains. (They run every 60-90 minutes or so during the day.) On the other hand, if you have some extra time, Aix is fun city to spend a little time in. This is our most popular route, in part because both less- and more-experienced cyclists can enjoy it. The longest biking day (apart from the Luberon) is the first day, at about 40 miles. You’ll face a couple of short hills the first day, but you could walk up the steepest one in five minutes. The biggest real hill that you need to get up comes on the fourth day, as we bike up to the ancient clifftop fortress of Les Baux. Less experienced cyclists may find themselves walking their bike for 10 or 15 minutes here, but it’s well worth it, to see one of Europe’s most impressive medieval sites. 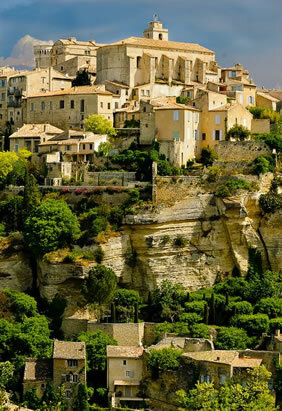 Two days later we get to the Luberon, a picturesque region of cool forests, a crystal-clear river where you can cool off on a hot day, and half a dozen small hilltop villages, each with its own personality and charm. We stay two nights in the same hotel here, so some travelers consider the Luberon a rest day and don’t bike at all. Reasonably strong cyclists will probably want to visit all six of the villages; others will just cycle at one or two. We can also suggest appealing bike routes that are short and flat, and there’s plenty to see and do for those who don’t want to bike at all. 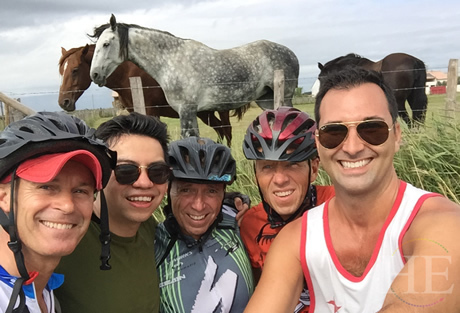 We offer trips in a variety of terrains; you should be able to find a bike trip on which you can complete each day's biking. 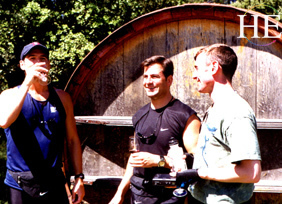 See our complete biking tours listing HERE. You'll have a much better vacation if you select a trip that's right for your abilities. I like to bike but my partner isn't into it as much. Is this a good trip for us? This is a great trip for the two of you. It includes two layover stops (when biking is optional, as we don’t change hotels), during which your partner can shop, hike, or go sightseeing, while you loop through the hilltop towns of the Luberons. On the other days of this trip, our “official” route from one hotel to the next is fairly short, but (as with all our bike trips) we’ve planned enjoyable longer options for those who want more biking. Typically you can expect temperatures to hit the high 60s in late April and early May, and to be well into the 70s by late May, June, and in September. Some days are likely to be in the 80s in July and August. June through August are the driest months, but it’s unusual for us to have more than one or possibly two days of rain at other times in the spring or fall. On a majority of our bike trips in France, we’ve had half a day of rain, or less. But, of course, we can’t promise anything about the weather. You can have a great time even if conditions turn out to be a little warmer, colder, or wetter than usual, as long as you bring suitable clothing. We’ll send some suggestions well in advance of the trip.